Qatar Airways and Royal Air Maroc have announced the launch of a strategic joint business agreement on their services between the State of Qatar and the Kingdom of Morocco. Qatar Airways Group Chief Executive, His Excellency Mr. Akbar Al Baker and Royal Air Maroc Chairman and CEO, Mr. Driss Benhima signed the joint business agreement today at the Arabian Travel Market in Dubai, in the presence of international press and travel trade partners. The joint business will benefit passengers by providing enhanced links between Qatar and Morocco, greater choice of flights to more destinations and improved frequent flyer benefits. With this new agreement, passengers will be able to purchase a single itinerary combining flights on both carriers’ global networks, affording them the ease of one-stop ticketing and baggage check-in. Royal Air Maroc will be operating three weekly flights with a Boeing 787 Dreamliner to Doha complimenting Qatar Airways’ existing seven times weekly flights to Casablanca, giving passengers the flexibility of using a combination of flights from both airlines between Qatar and Morocco, significantly increasing their options. Qatar Airways Group Chief Executive, His Excellency Mr. Akbar Al Baker, pictured right, addresses a packed press conference at Arabian Travel Market in Dubai on the airline’s expansion plans. With him is Royal Air Maroc Chairman and CEO, Mr. Driss Benhima. Qatar Airways Group Chief Executive, His Excellency Mr. Akbar Al Baker (right) and Royal Air Maroc Chairman and CEO, Mr. Driss Benhima addressing the media, during a press conference at ATM Dubai. 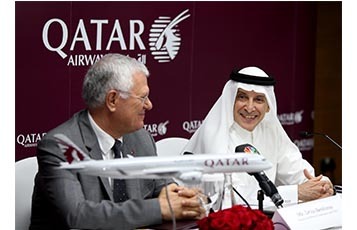 Qatar Airways Group Chief Executive, His Excellency Mr. Akbar Al Baker (right) and Royal Air Maroc Chairman and CEO, Mr. Driss Benhima signing a Joint Business agreement, during a press conference at ATM Dubai. Qatar Airways and Royal Air Maroc will also be improving flight transfers for passengers through enhancing and expanding the code-share network beyond their respective hub cities of Doha and Casablanca.